Frances Flower never dreamed a career in animal welfare would one day lead her to Texas and a job in a natural foods supermarket. But shortly after completing her PhD in our Animal Welfare program in 2006, the British-born Flower was recruited by Whole Foods Market. 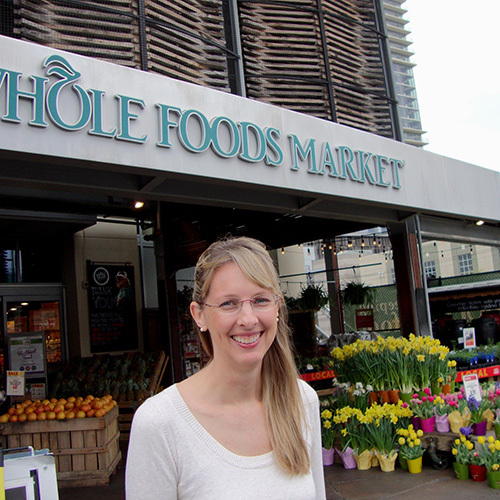 She moved to Austin, where the grocery chain’s head office is located, and has spent the past nine years running their animal welfare program. It all started with a love for animals. “I loved studying animal behaviour, why animals do what they do,” Flower said. While working on a Masters in Applied Animal Behaviour and Animal Welfare at the University of Edinburgh in the 1990s, she came across an ad for a research project led by UBC Animal Welfare Professor Dan Weary. Flower jumped on the opportunity to be part of the project, which was conducted at the UBC Dairy Education and Research Centre, a decision that led her to pursue her PhD in our Animal Welfare program. Flower’s experience working with dairy cows at the UBC Dairy Education and Research Centre prepared her well for her current role at Whole Foods; as a Livestock Associate, she works with 2,700 farms and ranches across North America to ensure that producers meet the company’s strict animal welfare standards. That standard requires that all the farms and ranches that supply the grocery chain with pig, chicken and beef must be third-party inspected and certified to Global Animal Partnership’s (GAP) 5-Step Animal Welfare Rating Program. The 5-step program rates how pigs, chickens, turkeys, and cattle are raised for meat.